What are the normal triglyceride levels I should have? Why is it so important to have normal levels? What are the normal triglyceride levels I should look for? Let's go step by step and see what's happening with your triglyceride levels. You should look for the levels of triglycerides of 150 mg/dl and less to consider yourself safe of any atherosclerosis or heart disease problems. 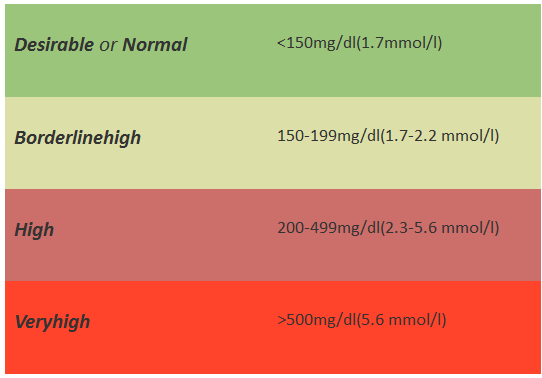 If your triglyceride levels are more than 1000mg/dl (11.30mmol/l), you will be at high risk of having pancreatitis. Your doctor must put you immediately under medications (e.g. Statins) to restore your normal triglyceride levels again. What test should I perform to know my triglyceride levels? Normally, your doctor will advise you to do a lipid profile (which measures cholesterol level, HDL-C level, LDL-C level, VLDL-C, and triglycerides level) every five years to monitor your susceptibility of developing cardiac diseases. In the majority of cases, your doctor will not ask you to do triglycerides blood test alone, because the risk of CHD is depending also on your cholesterol levels (Total cholesterol, HDL level, LDL level). What is more, triglycerides blood tests are done routinely as a part of your lipid profile test to help your doctor to determine your risk to cardiovascular diseases. These results will definitely help to observe people who have high susceptibility to heart diseases, people who suffered from previous heart attacks, or people who are treated from hypertriglyceridemia and/or hyperlipidemia. Though the scientists are not yet sure how the elevated triglyceride levels can cause atherosclerosis (which lead to heart attacks, strokes and even death); they are certain that hypertriglyceridemia always accompany other diseases which raise the risk to coronary heat diseases (CHD). According to American Academy of Pediatrics, children of high risk to develop heart diseases(hypertensive, diabetics, or obese) can make their first triglycerides blood test as well as lipid profile between two and ten years of age. As children less than two years old are so young to be checked. It is recommended that monitoring your normal triglyceride level must be done after nine to twelve hours of fasting of food, you can drink water only. Additionally, you must stop alcohol consumption for 24 hours before the test. What may cause elevated triglyceride levels? If you are suffering from diabetes, you must have your triglyceride levels checked regularly, as serum triglycerides levels are usually elevated in case of uncontrolled blood sugar level. - Drugs like beta blockers (hypertensive drugs), oral contraceptives (birth control tablets), steroids (cortisone), diuretics, protease inhibitors for HIV and Tamoxifen (cancer breast treatment) can raise your normal triglycerides levels. What strategies do I need to follow to lower my elevated triglycerides levels? The best strategy you doctor will follow to regain your normal triglyceride levels will be the proper medical treatment of the primary causes of hypertriglyceridemia. But when elevated triglyceride levels are not a result of another medical illness, they will usually be accompanied with high cholesterol levels, so your treatment will be aiming to decrease both triglycerides and cholesterol levels. The American Heart Association advises you to make serious change in your lifestyle concerning having healthy diet and moderate daily physical activity. Return to Cholesterol HDL LDL Home.